In many developing countries, when e-waste is being discarded off it is often crushed up and demolished. This process allows for dust (toxic chemicals) to be released into the air where workers and animals can inhale these fumes and potentially compromise their respiratory systems. These particulates when burned can travel hundreds of thousands of miles, affecting a large number of people and animals. When animals are directly impacted by air pollution it can potentially endanger their species all together as well as the biodiversity in the region in which they live. On a long-term scale, air pollution has the potential to affect plant species, soil chemistry, water quality, and directly impact ecosystems. Lead, which can be inhaled by humans, can also be ingested by plants and animals as well, therefore, affecting the water and soil in the region as well. When ingested by animals, lead can make it’s way up the food chain and potentially affect larger animals who eat it such as humans (Wilson, 2016). There are two main ways that soil can be contaminated. First, soil can be tainted if it comes into direct contact with a certain contaminant. 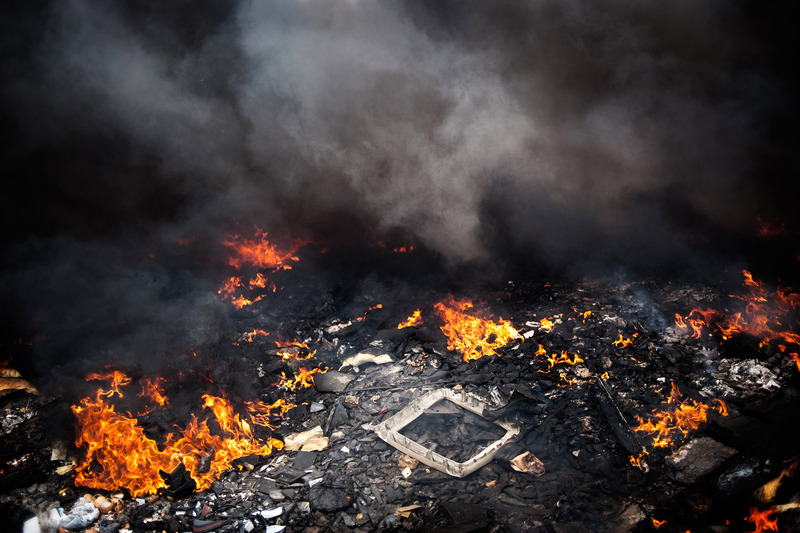 This can happen when e-waste is being dismantled, the release of particulars into the air can redeposit themselves back into the ground causing contamination. This can also happen when e-waste is being shredded or burned. Second, soil contamination can happen indirectly when contaminants find their way into the water system. This happens when e-waste is illegally thrown out, heavy metals can leach into the soil as well as into underground groundwater. In many third world countries, the heavy metals that are inside e-waste are very valuable. In these practices, they use mercury or cyanide to extract the metals and this can release more toxic material into the soil. Plants and animals are directly impacted by soil pollution. Chemicals that have leached into the soil can cause changes that affect the plants that many wildlife rely on for survival. Plants in these regions will often suffer from reduced growth, altered metabolisms, and damaged cell structures (Wilson, 2016). Water has the potential to be contaminated by e-waste in two ways as well. 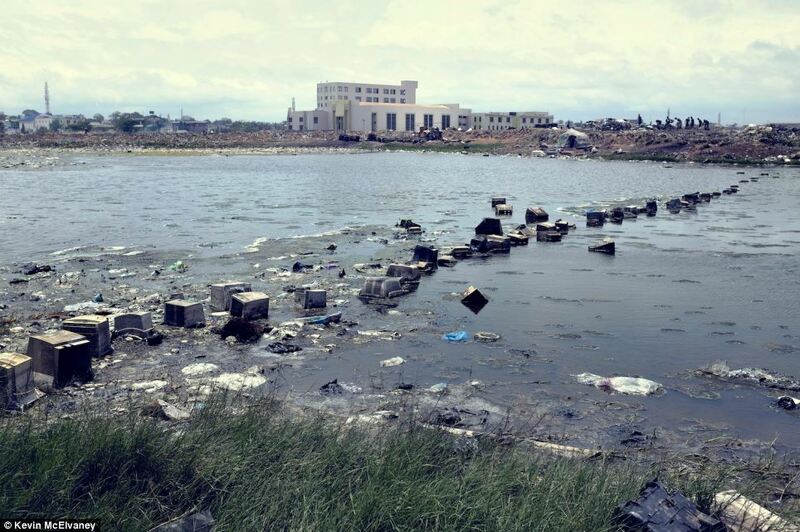 First, if landfills are not properly designed to hold e-waste they can lead to leaching. Groundwater that can be found near e-waste landfills has the possibility of being impacted when chemicals from these illegal landfills and dump sites seep into the water tables nearby. Second, water has the potential to be contaminated when there is an improper recycling of the product as well as insufficient disposal. This can be seen in the process of extracting precious metals from e-waste. This process of extraction requires a certain amount of water. If the water is improperly treated, it can potentially be released into local streams, ponds, or rivers and potentially impact millions of people as well as ecosystems. These ecosystems become contaminated through the acidification of waterways. Acidification has the ability to kill marine and freshwater organisms, destroy ecosystems and disrupt biodiversity. These heavy metals can directly impact fish who will ingest various amounts of chemicals. For example, fish who ingest mercury will develop disabilities, neurological damage, and deterioration of their immune systems (Wilson, 2016). Denise Wilson. 2016. WEEE: Waste Electrical and Electronic Equipment – Impact of WEEE UW Electrical Engineering. http://ewaste.ee.washington.edu/students/impacts-of-e-waste-on-the-environment/.